Known as the “Golden State,” California offers an abundance of pristine camping spots—regions that reflect the wide array of terrain that is present in the state. 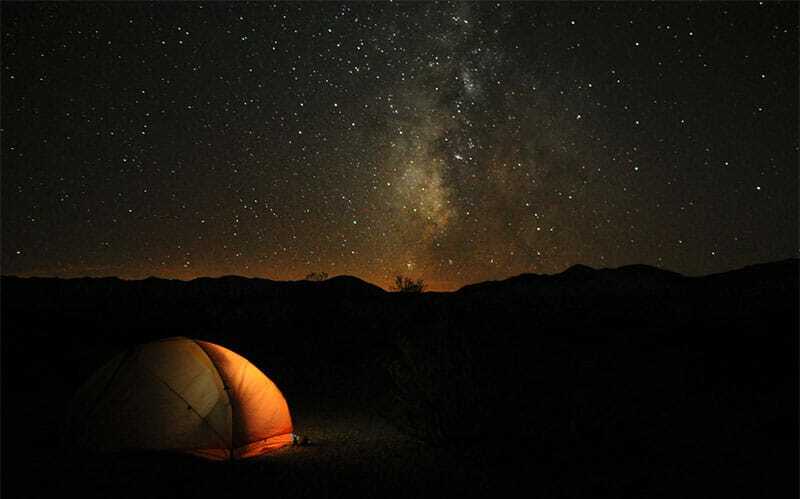 From secluded mountain retreats to camping spots along the beaches of the Pacific Ocean to the vast nothingness of the Sonoran and Mojave deserts, California is a one-of-a-kind paradise for outdoor camping and enjoyment. California is the most populous state in America. It is additionally the third-largest state by total area (after Alaska and Texas), offering a unique mix of urban, suburban and rural life, as well as scores of national parks and protected wilderness areas. From a geographic perspective, California is located in the far-western part of the United States, and shares land borders with the states of Oregon to the north, Nevada to the east, and Arizona to the southeast. California shares an international border with the Mexican state of Baja California to the south and the Pacific Ocean makes up the state’s western coastline. The state capital of California is the city of Sacramento, which is located in the northern part of the state. However, the largest and most populous city is Los Angeles. A majority of California’s cities are located in either the San Francisco Bay Area or the Sacramento metropolitan area in Northern California; or the Los Angeles area, the Riverside-San Bernardino-Inland Empire, or the San Diego metropolitan area in Southern California. Outdoor enthusiasts regularly flock to California for its diverse geography, which ranges from the Sierra Nevada Mountains in the east to the massive Pacific coastline in the west; from the large Redwood and Douglas fir forests of the northwest, to the Mojave Desert areas in the southeast. The central portion of California is dominated by the Central Valley, a major agricultural area, and California contains both the highest point (Mount Whitney) and the lowest point (Death Valley) in the contiguous United States, as well as an unbelievable number of outdoor camping areas. In the following article we will highlight five of these wonderful California camping oases, and provide a brief description of each of their characteristics and the activities available for those who opt to camp there. If you have ever experienced the hustle and bustle of Los Angeles County, you might be surprised to learn that there is a beautiful and very serene paradise just a mere 45 miles away: the Crystal Lake Campground. The Crystal Lake Campground is located high above the city of Azusa, California, from where campers merge onto Highway 38 en-route to the high peaks of the secluded San Gabriel Forest. This road to Crystal Lake is a winding and often hair-raising 30-mile drive, one fraught with hairpin turns and sharp switchbacks that can be treacherous to those unfamiliar with the highway, especially when driven at high speeds. As campers make their way to the quiet campground off the Crystal Lake turnoff, they will first notice the “Crystal Lake General Store,” a combination grocery/supply store and snack shack. Here they can pick up a wide variety of goods, such as fishing bait and tackle, charcoal, groceries, sandwiches and drinks, as well as a wealth of helpful fishing tips (what they’re biting on, etc.) from the longtime stewards of this always-welcoming store. Although a few of the sites at the Crystal Lake Campground accommodate recreational vehicles—and offer both water hookups and 15-amp electrical power—the remainder of the sites are somewhat primitive, with just a few modern conveniences. All campsites have running water and tent pads, and there are bathrooms and showers scattered throughout the park that are shared by campers. While the campground at Crystal Lake is beautiful, the true draw of this area nestled high above the Los Angeles foothills is Crystal Lake itself. Positioned in a crater with mountains and trees on all sides, Crystal Lake is admittedly small compared to most California mountain lakes, but it is always well-stocked during the fishing season with pan-size—and often larger—rainbow trout, small and largemouth bass, and large catfish who tend to bite better at night. From the campground, campers will need to descend three large stone staircases to reach the shores of the lake, but once there, both the fishing and the view make it well worth the extra effort. Located about halfway between the Southern California cities of Los Angeles and San Diego, near both Laguna Beach and Newport Beach, Crystal Cove State Park offers the best of beachside camping short of Catalina Island. Crystal Cove State Park offers both RV and tent camping—primitive campsites that are the real draw of this very scenic park. All Crystal Cove primitive tent sites are accessible only by foot, and all vehicles must be left at the park office. Getting to these sites involves a 3 mile hike inland from the parking lot, away from the beach, and the final destination is a secluded paradise that must be seen to fully appreciate. The Crystal Cove State Park tent sites are indeed primitive; no drinking water is available, so campers must pack it in, and there are a few restrooms that are shared among the entire campsite. The trail to the campground is a bit strenuous at times, and locals admit it can take upwards of 90 minutes to reach the final destination. There are many activities to pursue when camping at Crystal Cove State Park, including any number of beachfront pursuits and of course hiking. The backcountry and wilderness areas of Crystal Cove State Park offer campers18 miles of hiking trails through 2,400 acres of native wilderness, largely the endangered coastal sage scrub plant community. For energetic backpackers, there are three environmental campgrounds, one in a canyon and two at higher elevations along the trail. The higher trails offer beautiful vistas of the mountainous backcountry, geological formations, and a great view of the big blue Pacific Ocean below. Exploring the lower trails offers hiking through gorgeous woodlands with oak and sycamore trees along the seasonal Moro Creek. Whether you explore the high trails or the low trails or both, you will find ample evidence of native plants and animals, and a sense of escaping from civilization into the beautiful solitude of natural history. The Angel Island Campground, located at the state park of the same name, is one of the most popular camping destinations in Northern California. The largest natural island in the San Francisco Bay, Angel Island State Park provides some of the best scenic vistas of the surrounding Bay Area, and with its splendid hiking trails and the other recreational opportunities it offers, Angel Island is fondly regarded as a hidden jewel in the midst of this large urban sprawl. Angel Island State Park has a long and storied history, beginning with its earliest inhabitants, the indigenous tribe known as the Coast Miwok. The island represented a seasonal hunting and gathering location for the local native tribes, and a safe refuge and supply stop for Spanish explorers like Juan Manuel de Ayala, one of the first to chart the San Francisco Bay region. Angel Island State Park offers primitive tent camping sites, group and family campsites and environmental campgrounds, which are regularly used by researchers and school groups. No wood fires are permitted at any of the campsites, but campers are allowed to use propane grills and lanterns. Windsurfing/Surfing are also available. Those wanting to study the history of the island will find what they are looking for at the museum/historical center, and guided tours of the camp areas are available for an extra fee. Access to Angel Island State Park is by private boat or public ferry only. Those coming from the San Francisco, Oakland and Alameda areas will want to purchase a ticket on the Blue & Gold Ferry Service; while those coming from the Tiburon region will need to catch a ride on the Tiburon/Angel Island Ferry Service. Pets, except for service dogs, are not permitted on the island. Bicycles are allowed on Angel Island, and all riders under 18 years of age are required to wear helmets. Bike rentals are also available seasonally. Night travel after sunset on the island is prohibited in some areas for park security and public safety reasons. Moving now from the beaches of Southern and Northern California to the beautiful deserts of California, we come to the popular Corn Springs Campground. Located in the Chuckwalla Mountains, just east of Joshua Tree National Park, the Corn Springs Campground sits in the transition area between California’s high and low deserts. As such, the campground enjoys enjoy winter temperatures that are somewhat warmer than those in the nearby Mojave Desert, making it a great out-of-season option for outdoor camping enthusiasts. The Corn Springs Campground is tucked into a canyon in the Chuckwalla Mountains and is positioned roughly 1,600 feet above sea level. Winter temperatures here regularly reach into the high 70s during the day, but because the nights can be quite chilly, campers would be wise to dress in layers. A fairly small campground, Corn Springs offers nine pristine campsites under the desert sky, each offering drinking water, picnic tables and shaded covers. The campground additionally offers vault toilets and a half-mile, easy interpretive hiking trail that offers a chance to learn a bit about the palm oasis ecological community. The campground is ten miles off Interstate 10 at the Corn Springs exit, and the road is almost always passable by passenger cars. To be on the safe side, make sure you have a working spare and emergency supplies, as the canyon probably won’t have cell phone service anytime soon. The nearest amenities other than water and shade are 17 miles away in Desert Center, so plan ahead. Rustic Highway 88, which originates in Central California and winds northward into the Sierra Nevada Mountains, is teeming with wonderful campgrounds and wilderness areas, the finest of which is Bear River Park and Campground. The campsites at Bear River Park can be found on three sides of the Bear River Lake, the centerpiece of this large wooded oasis. Anglers in boats and along the shore can regularly be seen fishing here during the daylight hours. The lake remains fully stocked during the California fishing season, with both county and state plants of rainbow trout and brown trout, among other species—fish that put up more than a good fight and present quite a challenge for fisherman. Being that Bear River Park and Campground is situated in a heavily forested area, most of the campsites here are very quiet and secluded, offering campers plenty of privacy and an experience closely akin to genuine wilderness camping. Although the park provides restrooms with vault toilets and showers, there is no fresh drinking water, so campers will need to bring water with them. In addition to the fishing and boating opportunities available at Bear River Park and Campground, the park offers plenty of additional activities to keep campers busy. The region has a countless number of great wilderness trails that are perfect for hiking, backpacking, biking and nature walks; two horseshoe pits; a playground for the kids; a rustic clubhouse with a bar and snack area; and a camp store that sells groceries, souvenirs, supplies, bait and tackle. The campsites at Bear River Park and Campground are available on a first come, first served basis, and the rates are very reasonable for both the primitive tent sites and family camping areas.